Rukzuk out of Konstanz, Germany has come on the site-building scene and wants a piece of the ever-growing pie. To that end, Rukzuk doesn’t aim directly at individuals who want to build their own website. Instead, Rukzuk seeks to make a name for itself as a serious tool for professional web designers. Competition in this segment is certainly scarcer, but it exists nevertheless. We’ve put Rukzuk under the microscope. 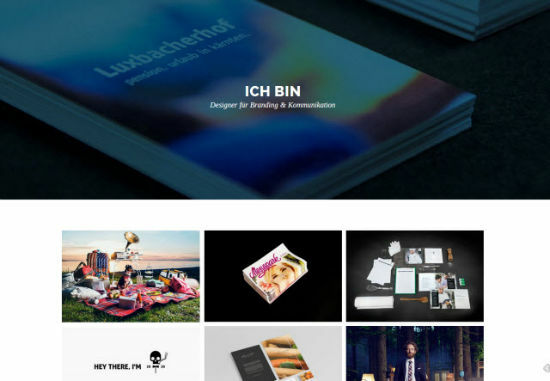 Rukzuk began life as an internal toolkit of Konstanz-based agency Seitenbau GmbH, where early versions of the software were already crafting websites for clients like Deutsche Telekom. Rukzuk was honed over years of development, proving its mettle in day-to-day work until it grew into a stand-alone brand. That’s all very confidence-inspiring; perhaps this might be a product that truly can meet all the demands of a web designer. So just what are the typical problems encountered in a typical project? The project needs to be designed. The project will eventually need more features. The project almost always needs a CMS. Until now, the designer would design in Photoshop with subsequent conversion into HTML/CSS, and the developer would develop additional features and tailor everything to the chosen CMS. With Rukzuk, that’s no longer necessary. Rukzuk allows the designer to design without coding knowledge while empowering the developer to develop necessary function modules without worrying about the design. And Rukzuk likewise comes with a CMS. It sounds like the complete package because it is the complete package. All that’s missing are business-centric elements (customer relationship management, accounting, etc.) that could make Rukzuk self-sufficient in running a business. That shouldn’t be taken as criticism, however, as Rukzuk makes no such claims for itself to even try to offer such a full-service solution. If you’ve already worked with other website builders, you’ll know that, as a rule, the websites you create are also hosted by the same service provider. In other words, you don’t need any additional webspace. Many site builders work directly with registrars to sell you the desired domain. Most competitors make it impossible to circumvent this step: you have to host your website through them. Rukzuk differs in a few respects. Like other services, Rukzuk offers a subdomain as standard, in the following scheme: http://<123-456>.zuk.io. This is entirely sufficient for development but can be problematic when going live. Alternately, you can connect Rukzuk to existing domains: another common option. You change the CNAME or A record through your domain provider and pass along the DNS inquiry to Rukzuk. What I haven’t yet seen elsewhere is the third option. It entails hosting the website through a third-party. This can either be done automatically by pasting the FTP credentials into Rukzuk or manually by downloading and then uploading the pertinent files to your webspace. The only requirement is that the host supports PHP 5.3 or later, which is a given for any well-known provider. With this third option, Rukzuk deals a swift blow to a major criticism leveled against website builders. Some people dismiss site builders based on their distrust of service providers to store the websites without at least the possibility of backing up locally. This is to say nothing of the fundamental hole in that argument: that every provider can fail economically and thus break totally. The web presence you create with Rukzuk will therefore live on if you decide to take your site elsewhere, even if Rukzuk should go down for reasons either technical, economic, or anything else. Unlike some other services, Rukzuk offers no free plan. For perfectly understandable reasons, publishing for nothing is not a sustainable model for success. Despite that, you don’t need to break out your wallet right off the bat. Rather, you can vet Rukzuk’s full feature set to your heart’s content. There is no time limit. There’s only one catch: as soon as you want to publish your website and make it accessible to everyone, you’ll need one of the paid subscriptions. And despite the fact that Rukzuk is geared first and foremost toward agencies and independent designers, its developers nonetheless offer a plan called "Rukzuk One". 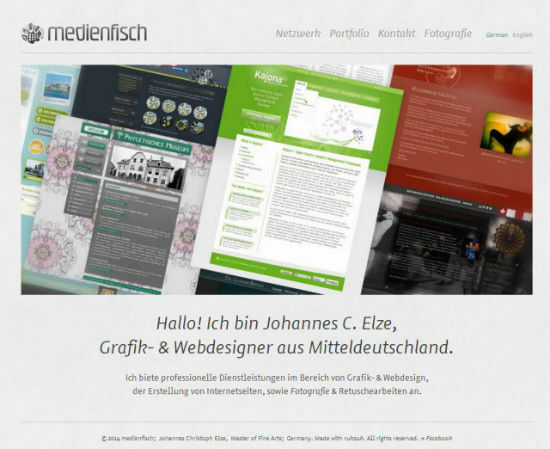 For 12/15 Euro per month (for annual/monthly payment) you get one project and one live website. It’s their appeal to the customer of classic website builders: the ambitious website owner who either cannot or doesn’t want to hire a designer. The "Rukzuk Freelancer" plan is geared towards the freelance designer, enabling ten projects and three live websites for 19/25 Euro per month (annually/monthly). 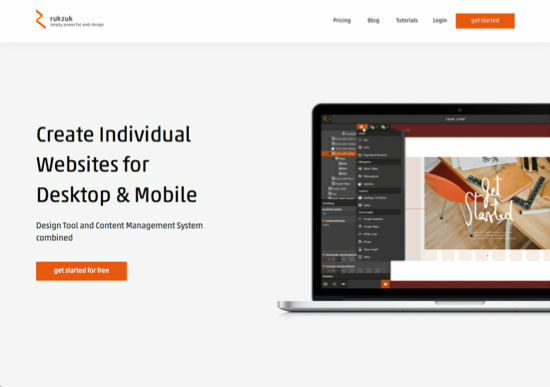 "Rukzuk Studio" is marketed toward smaller design teams and offers the ability to create custom modules and manage 20 projects with 10 live websites. For that you need to pony up 49/69 Euros per month. The creators claim that the future will bring the "Rukzuk Agency" plan. 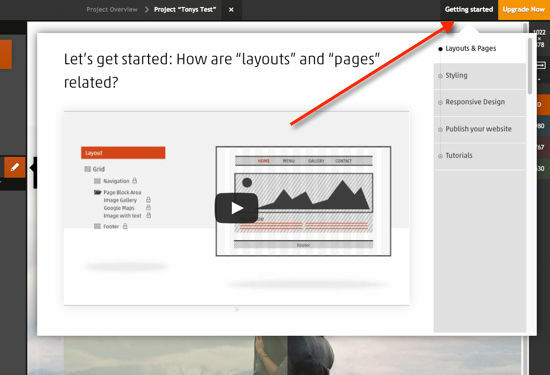 It will offer customizable modules and 50 projects with 30 live sites. Specific to this this plan is co-branding the back-end, i.e. offering the customer a white-label variant that obscures Rukzuk as the service provider. This plan will cost a pretty 259/299 Euro per month. But what if 30 websites aren’t enough? Upon request, Rukzuk will discuss individual enterprise plans. In all fairness, competitors also have similar restrictions, and must either turn down larger contracts or specifically tailor larger plans. In the international arena, Rukzuk’s pricing is very competitive and doesn’t need to hide in shame. Freelancers and agencies will be happy to hear that complete projects can be transferred over to clients. The client will receive an invoice from Rukzuk for the operation of the website and and the running costs don’t need to be continuously calculated. Rukzuk scores points in our part of the world for offering the complete product in German. The client should be thrilled not to have to grapple with text in a foreign language (English, ordinarily). So too is the editor itself provided entirely in German. By default, Rukzuk matches the system language of the browser in use, so if your browser is set to English, Rukzuk will display in English. The language can also be manually set, which is useful if, for example, you want to keep your browser in German but want to use Rukzuk in English because of coding terminology. When you register (which requires no payment information) you’ll be greeted with a dialogue box from which you can initiate a new project or open and edit an existing one. Click "New Project" and you can choose from eight completely professional templates, two wireframes, or a completely blank project. Newcomers should opt for a full-fledged template to acquaint themselves with modules and other site elements. After you’ve made your decision, the editor proper opens, which, primarily for its coloration, is reminiscent of the Adobe’s Creative Cloud. It soon becomes clear upon closer inspection that Rukzuk follows an entirely different control concept. 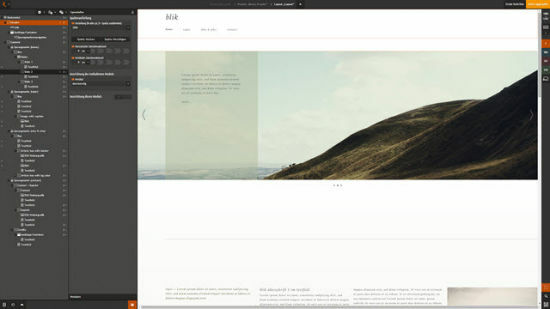 In contrast to Creative Cloud and other services, Rukzuk has a WYSIWYG interface, though it’s not 100% drag and drop. To be sure, design elements can in part be selected and inserted with the mouse. 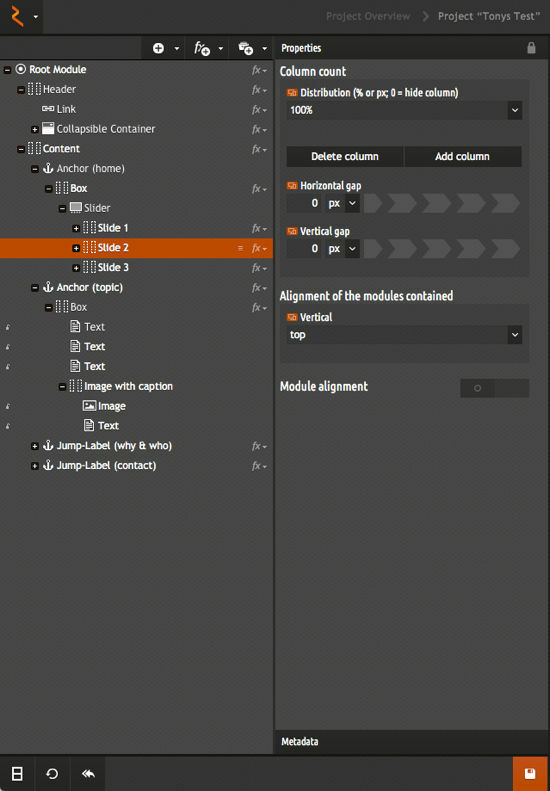 Parameters and options are defined by values and sliders. Exceptions like the grid module prove the rule. 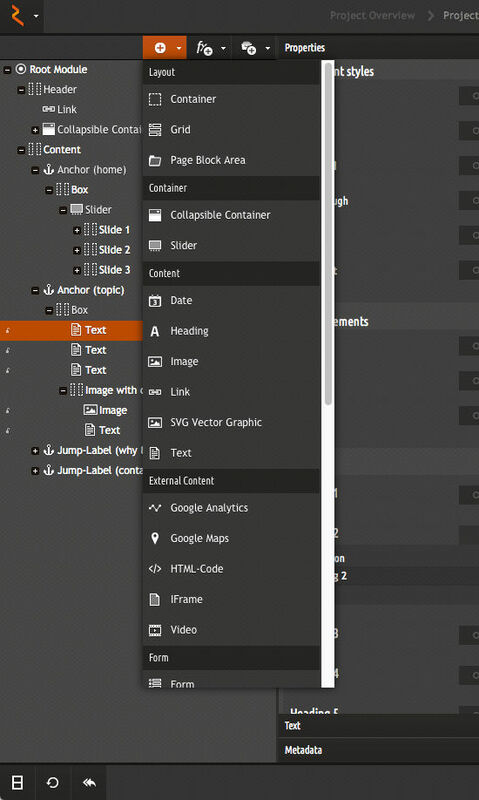 The main editor window is not the actual layout, but rather the sidebar tree on the left which houses many nesting menus. Take a look at the dense list with its myriad expansions and clarity may not be the first word that comes to mind. The level of detail in the editing is far more granular than in other services. Rukzuk facilitates the learning process with a button at the top right corner of the browser window labeled "First Steps". Clicking it produces an overlay providing charming and helpful tutorials for beginners without ever leaving the editor. 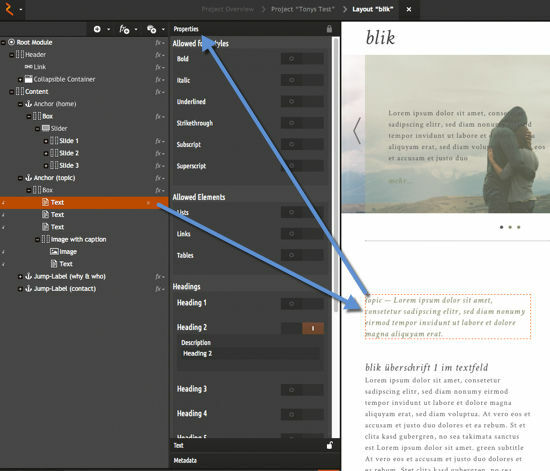 Rukzuk supports responsive design with breakpoints. 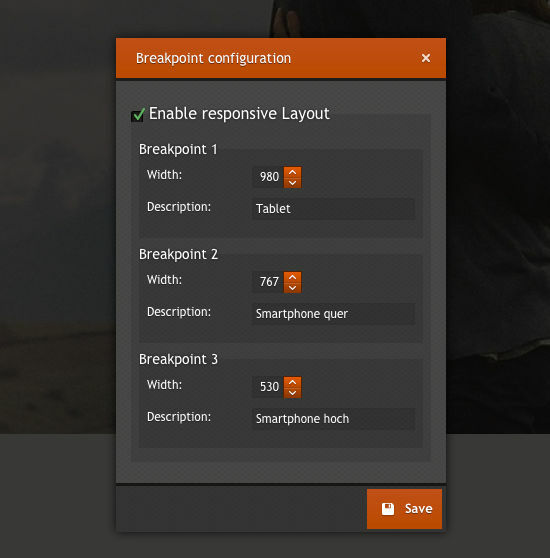 Via the breakpoint triggers on the right side of the screen you select different screen widths for various devices. 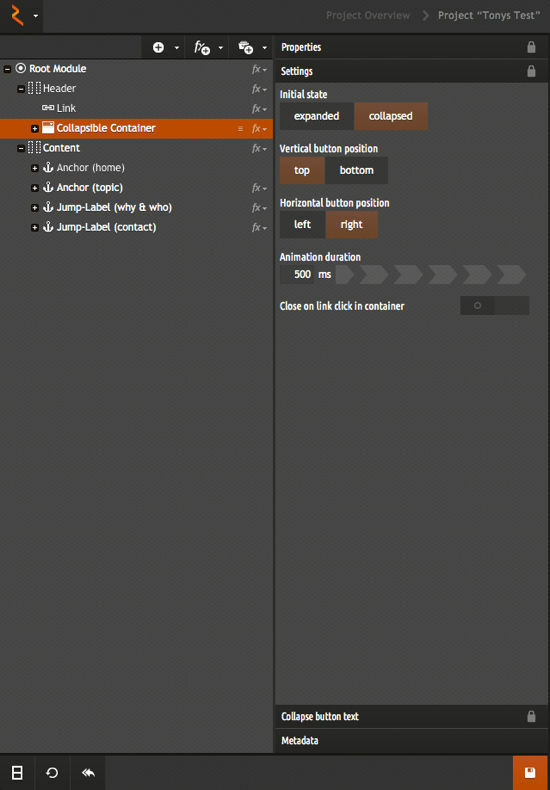 The design can then be refined in the left sidebar for various resolutions. Designs are conveniently tested by generating a QR code that you open on a mobile device, giving you a preview of your layout. It’s simple and effective. As opposed to something like Webydo, the creators behind Rukzuk take great pride in the responsive design capabilities of their software, provided you want a fluid layout. Rukzuk’s modules have no fixed dimensions, but instead fluidly adapt to the conditions. It’s surprisingly clear how Rukzuk’s operating concept deviates from established standards. Rukzuk certainly has a learning curve, and that’s not to be dismissed, but that’s not at all to say it doesn’t pay off. What’s important is being aware of this and making an informed decision. Nor should I conceal the fact that there are currently no comparable alternatives on the market, and even those with a slimmer feature set aren’t exactly learned in the blink of an eye. To Rukzuk’s credit, it is a product that has ripened over years of steady development, proving its competence several times over. And it’s a German product, to boot. The creators valued the service so greatly that they spun the product off from Seitenbau GmbH as its own publicly held company. If you have no coding experience, i.e. purely a designer, then you’ll have to acclimate to a given product no matter what. Of course, it will be easier if the product isn’t completely alien to what you’re used to. On the other hand, what use is a more user-friendly tool if it doesn’t have the features you require? If you’re an ambitious website owner who wants to build and maintain your own site quickly and easily, then Rukzuk is also a solid choice. If you’re just looking for a sort of web flier for your dog-walking service, then there are other perfectly suitable alternatives on the market with gentler learning curves. As a business owner you have to honestly appraise the abilities and needs of your employees and decide if Rukzuk should be your new primary tool. For one thing is clear: Rukzuk is too complex for only occasional use. If you’re in this circle, then I suggest taking the contender from Lake Constance out for a spin no matter what. Test it to your heart’s content. It’s not just some theoretically functional service that has limitations in professional applications: it’s software that has been put through its paces in the real world, honed through actual use, and it can do far more than meets the eye upon first glance. I know of every site builder worth mentioning in the whole wide web; several I know like the back of my hand. None of them can match the breadth of capability Rukzuk boasts. If you’re already familiar with visual web-design software and have some coding knowledge, you’d be hard-pressed to find even a comparable service, let alone a better one. If on top of that you’re working on behalf of a German company, the complete German language support and the responsive and amenable developers are crucial factors. I’ll gladly repeat what I’ve said several times: try Rukzuk yourself, but give yourself plenty of time for it. Like a good tea, Rukzuk needs to steep a bit. The system doesn’t bare its soul immediately, but when it does it sticks with you like a good song you just can’t get out of your head. In now days, I think Website Builder is something for advanced users, as for average users like me will find it too complicate. Yes you are correct, if you need customizations then inevitably you would need to know coding, as there is only so much you can do through visuals. Good to know about rukzuk, since I was knowing only Drupal,Wordpress,Joomla,magento eCommerce. Well! I have never used rukzuk before. Drupal,Wordpress,and magento are popular ones for me.